In the construction phase, the Mistral will primarily be used by JDR Cables to complete the last step of the array cable termination, connecting the array cables to the turbine switchgear located in the transition piece. Stuart Reid, Head of Ørsted’s East Coast Operations in the UK, said: “Hornsea Project One is a step-change in offshore wind farms in terms of scale, capacity and distance from shore. We provide offshore logistics for some of our contractors, so in this case we planned to use a vessel we already had, rather than hiring a new one. Lars Høy Jørgensen, Head of Operations Logistics, the team that has lead the development and delivery of the vessel, explains: “Building further offshore allows for bigger wind farms with much higher wind speeds. As a wind farms get further and further out to sea, it becomes more efficient for technicians to stay offshore for weeks at a time, rather than retuning to shore every day, a bit like oil and gas operations. The Mistral has already visited the offshore site for some testing, including trying out the motion compensated gangway to access wind turbines, deploying the work boat and landing a helicopter on the helipad. The vessels are outfitted to a similar level as cruise liner (but without a bar)! Unlike its sister ship, the Mistral has a heli-pad – and it’s the first time a vessel equipped with a helipad will be used for regular maintenance of an Ørsted windfarm. The meaning of “Mistral” is a strong cold north-westerly wind that blows through the Rhône valley and southern France towards the Mediterranean, mainly in winter. The motion compensated gangway allows technicians to safely walk onto the wind turbines in much rougher seas than when using the traditional method of transferring from a boat. This is vital when operating at the distance from shore like Hornsea Project One where weather conditions can be more extreme. The boat landing has been designed and built bespoke to fit the crew transfer vessels working on the project. 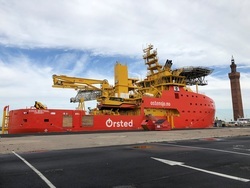 Ørsted first used a vessel like this for Operations and Maintenance for Race Bank offshore wind farm, which became operational earlier this year. The vessels have been supplied by Norwegian company, Østensjo Rederi, and were designed by British company Rolls Royce.